While George Burns and Gracie Allen were uproariously funny on stage, screen, and television, radio was - and remains - the preeminent showcase for their comedic talents. Here you’ll find 20 digitally remastered and restored radio episodes, including some available here for the first time anywhere, featuring big name guest stars like Cary Grant, Ray Milland, Hedy Lamarr, Charles Boyer, Ida Lupino, Bing Crosby, Cesar Romero, and more! Aiding and abetting the stars was a top-notch supporting cast that included announcer-sidekick Bill Goodwin, bashful bandleader Meredith Willson, and rascally regulars Hans Conried, Mel Blanc, Elvia Allman, Joseph Kearns, Bea Benaderet, Arthur Q. Bryan, Paula Winslowe, Verna Felton, and Gale Gordon. 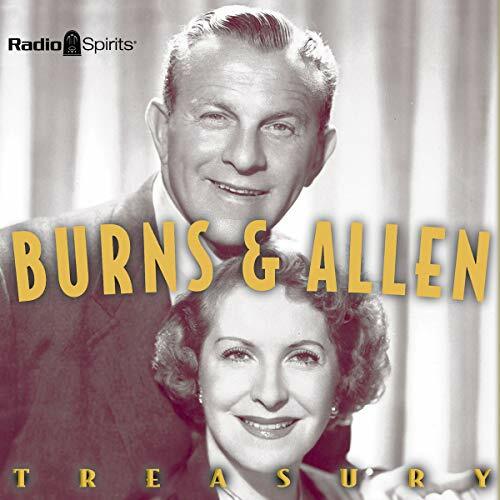 Burns, Allen, and the crème de la crème of Hollywood talent will have you doubled over in laughter, enjoying one of the true delights of Radio’s Golden Age. Episodes include: The George Burns & Gracie Allen Show: Twenty Dollar Debt 05-04-43; Dotso 05-11-43; Mr. Sunshine 05-18-43; Collecting Waste Fats 06-15-43; Guest: Brian Donlevy 09-14-43; Guest: Ray Milland 09-21-43; Guest: Ann Sheridan 09-28-43; Guest: Pat O’Brien 10-19-43; Guest: Hedy Lamarr 10-26-43; Guest: Walter Pidgeon 11-16-43; Guest: Loretta Young 11-23-43; Guest: Charles Boyer 11-30-43; Guest: Ida Lupino 12-07-43; Guest: John Garfield 12-28-43; Maxwell House Coffee Time: Surprise Housewarming Party 09-29-45; Guest: Frances Langford 05-29-47; Guest Cary Grant (and Cousin Nellie) 10-16-47; Guest: Cary Grant (as Gracie’s husband for a day) 10-30-47; Guest: Bing Crosby 12-04-47; Guest: Cesar Romero 01-20-49. ©2011 Sandra & Brad Burns. All Rights Reserved. Manufactured under exclusive license by Radio Spirits. Unauthorized duplication strictly prohibited. For home use only. (P)2018 Sandra & Brad Burns. All Rights Reserved. Manufactured under exclusive license by Radio Spirits. Unauthorized duplication strictly prohibited. For home use only.